During the holidays, we all want to have a house that resembles Clark Griswold’s in “National Lampoon’s Christmas Vacation” … well, at least to some extent. Holiday outdoor lights bring feelings of merriness and cheer that excite many homeowners once December hits. For some, it is tradition to hang lights, while for others it may be something they do to appease their neighbors. No matter the type of person you are when it comes to holiday celebrations, we know you’ll be decorating your outdoor area in some way this holiday season. 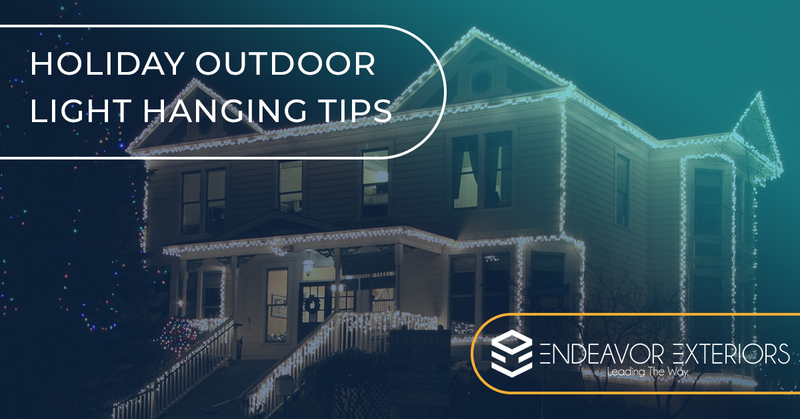 That’s why, in today’s blog post, we’ll go over some holiday outdoor light hanging tips. We know it’s common practice to string lights along your roof, and roofs are our specialty here at Endeavor Exteriors. If while you’re hanging up your holiday lights you notice some issues with your rooftop or find that you’re interested in possibly getting an entirely new roof, don’t hesitate to reach out to our team of experienced roofers. We offer an array of residential roofing services to Denver and surrounding communities, including roof repair, roof replacement and roof maintenance. Contact us today for more information. First things first: You want to ensure all of your lights are working as they should be. Whether you opt for colored or white lights, you don’t want to hang all of your lights only to find that when you turn them on, there are several that are blown out or missing. Simply plug in your lights before you get going on hanging them on your roof. This is also the perfect time to attach your light clips, ensuring they’re all facing the same direction. Almost all holiday lighting designs incorporate the use of your roof. Use an all-purpose light clip to attach lights to your gutters or shingles. These clips are compatible with most light types, and you can find them in your local hardware store. Keep in mind that you should never use a stapler to attach your holiday lights to your roof’s shingles or gutters. This method will destroy the structural integrity of your home, and staples aren’t strong enough to withhold the crazy winter weather conditions that we get here in Denver. After you’re done with stringing lights along the line of your home’s roof, next opt for any landscaping you have in your front yard — especially any trees or bushes. To hang holiday lights in your trees, try using a light-hanging pole, which is a great solution for when you don’t want to get on a ladder. Last but definitely not least, wrap holiday lights around any porch railings on your home. This is a tiny detail that can really make your home pop. You can either twirl lights around your railings or invest in deck clips. Either way, you’ll have a beautiful end product. Let’s be honest — are you really going to remember to turn off your lights every night before you go to sleep? Probably not. Invest in an outdoor timer and attach your holiday lights to this timer to ensure your lights turn off (and on) whenever you want them to. Some timers these days even have light sensors that will automatically turn them off once the sun comes up. Technology is super cool, right? Voila! Your home is now a holiday masterpiece. Stand back, grab some hot cocoa and admire your work. And remember — it’s best safety practice to take down your lights within 90 days of putting them up. Sometimes, it takes decorating your home during the holidays to notice the condition of your roof. If you need a professional roofer to inspect it, reach out to our team at Endeavor Exteriors. We are experts in all things related to residential roofing, and we have some of the best roofing contractors in Denver. Contact us today to find out why our digital experience is something homeowners in the local community are raving about. You can reach us by calling (720) 464-3472 or by completing our form online.